There is no such thing as too late or too early when it comes to doing a wardrobe overhaul. Giving your closet a makeover depends on how you evolve as a person and how you personally define comfort when it comes to fashion at any particular point in your life. So it doesn’t matter if you’ve been doing a yearly raid of your closet or this is the first time you’ve ever considered a closet makeover. The real question is, how? Revamping your wardrobe is hard for many reasons. First, if you don’t know where to begin with, making the mistake of throwing out a classic piece can be costly. Secondly, most people have sentimental attachments to their personal belongings, so it’s naturally hard to let some things go. The key is in how you put value in material possessions. This article guides you to the step-by-step process of updating your closet using a gradual approach that lets you find that sweet spot between function and aesthetics. All ten steps encompass a top-to-bottom makeover with your personal style as the end goal in mind. You already have a goal in mind: to revamp your closet. But why are you doing this in the first place? What do you find unsatisfactory with your current style? Take the time to look at your closet and evaluate what you still like and which should move on. An assessment is important for goal setting, and oftentimes, it’s also the one that requires much introspecting. But once you get it out of the way, you will have the compass you need in making future decisions that you’ll be making in this process. How does your current wardrobe reflect your comfort and style? Are your shopping habits practical and sufficient? It’s best to get your answers written down. Based on these answers, you will be able to properly formulate a clear goal of what your resulting wardrobe should look like. If you don’t have a clear idea of the style that really speaks about you, a good trick is to spend a good amount of time going over style magazines, blogs, shows, and yes, Pinterest! The idea is to expose yourself to different styles, colors, combinations, textures, and aesthetics. The reality is, you may already have a baseline of what you really like. For example, you may have an innate liking for khaki or gold. Perhaps you’ve always preferred sneakers over heels. But some styles you’ve never seen before can also appeal to you, and that’s the goal of this step. After you’ve collated your inspirations, look for patterns and similarities. At the end of your session, you should be able to come up with a list of style elements that you are drawn to (e.g., types of fabrics, whether classy or playful, prints or plain, layered or simple, etc.). Just because you like a certain style combination does not mean it will fit you. You may find that you’re not comfortable wearing it or realize that it’s not really you. So in this step, you need to experiment. Using the styles that you’ve identified in the previous step, your new mission is to find out which ones work. This also serves to help you identify your certain peculiarities in wearing certain types of clothing (like wearing only dark-colored tops to fit your body shape or using accessories to enhance your look). So how to do it? Don’t buy. Instead, faux-shop around your favorite brands and stores, and try on different combinations. You don’t have to buy them, although you can always take note of the pieces that you’d like to buy later. Another alternative is to do your closet revamping process with a friend. This way, you can swap clothing when experimenting. Now that you’ve gained tons of aesthetics for inspiration and have already experimented with them, you are now ready to create a clear and definite profile of your personal style. The key to doing this is to extract the core principles of the varying styles that you are drawn to. What’s the theme? What makes them stand out? What made them attracted to you? What are the colors you are most drawn to? Do you like your clothes a mix of classic and modern? Does the current fad appeal to you? Just like in step 1, write them down. Then make it your own. Now it’s time to detox. Go through your wardrobe piece by piece, and remove anything that doesn’t make your cut (that is, your style) or anything that does not make you feel confident. This is a necessary step that will help you get your shopping habits in sync with what your wardrobe needs. By determining which of your current clothes you can still wear, you will be able to prioritize what to buy next. Take note of the clothing items that you’ve removed from your closet. Ask yourself why you made the decision to remove them so the next time you will also know which ones to avoid when you do your shopping. When you’ve chosen the items to discard, you can give them away to charity or sell them online. The second option is lucrative as it allows you to earn extra cash, which you can save or use to buy clothes that are more to your liking. In this step, you will learn to separate what you really need from what you simply like. By analyzing how you often dress up and for what purposes, you will be able to determine what and how much you need. For instance, if you go to an office with a strict dress code, you may have to prioritize buying formal clothing (in your style, of course). If you have a monthly meeting with your girlfriends, you will have to consider that as well. Assess how often you need to attend gatherings, to the beach, or to travel. 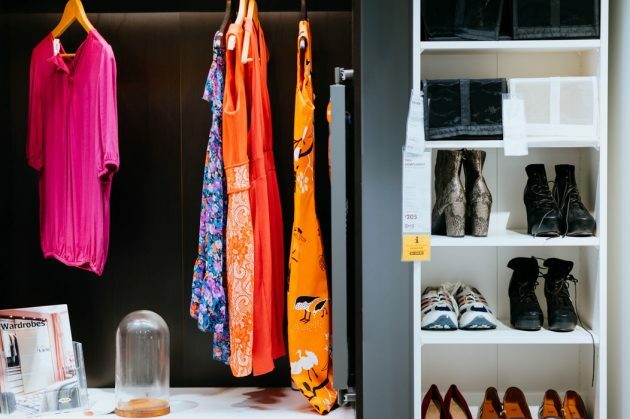 All these are important to consider so you won’t have to clutter your closet with clothes that you will probably only be able to use once in a year. It’s time to concretize what your ideal wardrobe should look like. Working on pieces that you already have, now you have to fill in the gaps. The goal is to create a wardrobe that works together, ones that you can mix and match. This way, you’ll have a lot more variety in just a few pieces of clothing. You can set out with a color palette in mind or prioritizing classic pieces that are always in vogue. After you’ve mapped out your necessary pieces by priority, it’s time to go get them. If you did a major overhaul, you’ll probably need a big sum to buy them all, but you don’t have to. Your new closet should not leave a dent in your bank account. That does not mean you can’t dress the way you want. Start wearing your style and add to your wardrobe whenever you can, no need to rush. After successfully overhauling your closet, you can now mix and match and experiment with different looks. It will be helpful to find a go-to look for your primary activities like work or social gatherings or dinner dates. Try out accessories as well, and see how they useful they can be in improving your overall character. This way, you can own your style and won’t have to overthink everything each time you go out. Now that you have a fresh, new wardrobe, your task is in maintaining it. Consider the way you shop and if there should have to be changes in the frequency that you buy new items. You don’t want to end up with a cluttered wardrobe again in one month. Keep your style in mind whenever you head down for a shopping spree. Revamping your closet is a very personal process. And just like any other personal decisions, it requires striking that sweet balance between needs and wants. These steps are designed so that you arrive not only at a wardrobe you’d like but also one that is practical, sustainable, and concurrent with your lifestyle.